A few days ago, I sent out a tweet wondering how long it would be until Google Reader added a tweet button to the bottom of each feed item. My guess was that it would be very soon. I was quite right. Today, the Google Reader team has unveiled a bunch of new updates to the product, including, yes, the ability to easily tweet any item. But that’s hardly all this update contains. You can also now easily send feed items to a number of places including Facebook, MySpace, Digg, StumbleUpon, Blogger, and others. 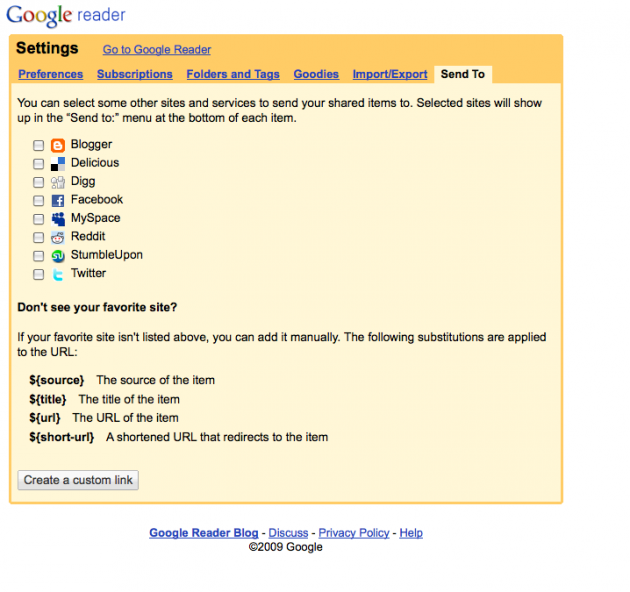 To enable any of these, simply go to the “Settings” area of Google Reader and enable the ones you want to use. If the services you want aren’t listed, you can even customize the “Send To” feature to enable sending items just about anywhere. Another new feature allows you to easily subscribe to feeds owned by people you are contacts with. This is an obvious, but nice addition, as it makes it easier to locate feeds you may be interested in — assuming, of course, that you’re actually interested in the people you follow on Google Reader. This feature also includes Twitter updates, so you can easily import all of those and see that person’s tweets through Google Reader if you don’t feel like scanning Twitter all day. But the best feature of the bunch may be the ability to have more control over the “Mark all as read” functionality. We all use the “Mark all as read” button when we’re too far behind on our feeds to possibly catch up. But now you can just mark items that older than a day, a week, or two weeks as read, saving the newest ones for you to still be able to read. That’s a great idea. 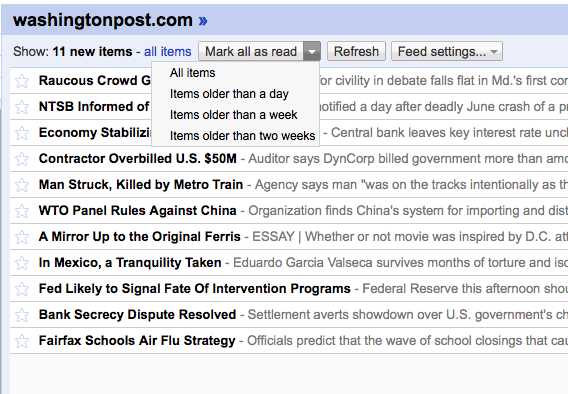 Google Reader still has some social issues, but it’s hard to argue with any of these features.